Excitement is building for the next Catholic Services Appeal (CSA) campaign cycle which is upon us! 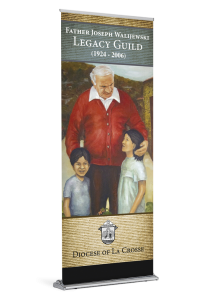 This year the Office of Communications for the Diocese of Grand Rapids is pleased to present you with a new option for promoting the campaign in your parish – retractable Custom Banners. 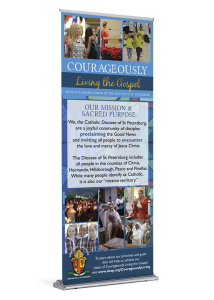 The Banners are an extension of the promotional items currently provided to parishes for use during the campaign including posters, postcards and an infographic. 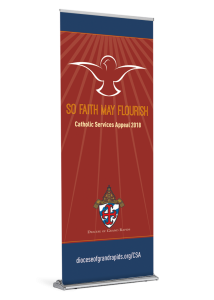 Banners are dated for this year’s 2018 campaign: So Faith May Flourish. 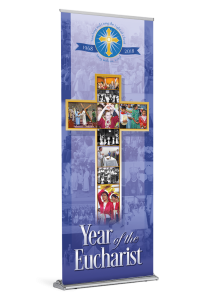 During the Year of Mercy (2016), every worship site in the diocese was provided with a customized Diocese of Grand Rapids Year of Mercy Banner and a reusable Stand, if you did not previously own one. This Stand can now be used to promote the CSA by switching out the Banner. It is approximately 84″ tall. It is printed on durable, high quality paper with water resistant inks.